5G is no longer future tech. Commercial 5G phone networks and 5G-enabled smartphones will be rolling out in 2019. (Source: ZDNet). But with 4G wireless still getting faster, why is the industry already jumping into the 5G fire? In a word, data. Research from IDC tells us that currently, more than 5 billion consumers interact with data every day. By 2025, analysts predict that number will be 6 billion, or 75 percent of the world’s population. (Source: IDC). 5G mobile data connectivity promises to keep up with our insatiable demand for data. 5G and fiber-based connectivity promise unbelievably faster broadband speeds, but even more importantly this next-gen mobile connectivity will have enough capacity to support users, regardless of how many people are connecting at the same time. Commercial 5G networks will run on a new high-spectrum band, which uses higher frequency signals than 4G. The previously inaccessible high-frequency band was dormant, prior, because of high costs and government regulations. The newly opened 5G band consists of millimeter radio waves between 30 and 300 GHz. The new band means that 5G networks will be much less congested than current 4G networks, which is critical. In some major cities today, users are already experiencing slowdowns during the busiest times of day (mainly during evening hours). In addition to increased capacity on the network, 5G signals will also deliver much faster broadband speeds, reaching multi-gigabit level speeds. In metropolitan areas, those numbers would equate to 5G speeds that are consistently above 750 Mbps. For those businesses and individuals that reside in the city that’s great, but it’s also good news for users in rural areas in the US. Carriers predict that even those in remote locations should expect faster internet service with 5G. For example, with 5G even ‘one-bar signals’ would be faster than traditional 4G services showing ‘four bars.’ If these breakthroughs sound exciting to you, check out these additional benefits and network characteristics expected in the 5G era. Ending the battle between Wi-Fi vs. LTE – ‘Always connected’ is here. Even more, than supercharging broadband speeds and increasing data capacity, another 5G contribution is that it will unite wireless, wireline, and satellite services under a common structure – ending the battle between Wi-Fi or cellular connections. Imagine a world where we no longer hunt for a Wi-Fi signal in a coffee shop or restaurant to ‘save our data’ and then switching over to our LTE cellular signals when no Wi-Fi is available? Instead, we’ll seek 5G always. Eventually, all devices will run on the 5G ‘new radio’ or NR standard, opening up an era of truly always-connected mobility. A growing opportunity for resellers and VARs – 5G signals can’t travel as far as current 4G signals, so there’s a need to establish a higher number of access points closer together, which will add to the complexity of designing and constructing 5G networks. So when it comes to providing dedicated indoor coverage for buildings, there will be significant opportunities opening up in the market for VARs and systems integrators to meet this demand. Building owners and businesses will be turning to these technology partners to develop networks which are cost-effective and can support multiple operators. Large venues, like stadiums and airports, will make moves to create their own networks, which will be designed to be shared by various operators. Sometimes called a ‘neutral host’ the idea is these networks will enable a venue to own the network, and open it up to many different operators to supply connectivity. Realizing Internet of Things (IoT) potential – 5G is expected to slash data delays from an average of about 100-200 milliseconds with 4G, to 1 millisecond or less. Because of these latency improvements, mobile connectivity becomes always-on, ultra-reliable, and ultra-secure. As a result, devices and sensors that need instant connections, such as IoT deployments, Machine-to-Machine (M2M) communication or Industrial IoT (IIoT) will thrive in a 5G world. This might include sites with a high volume of connected devices like manufacturing plants, mining and oil operations, or shipping ports. Further, 5G can also be configured to manage different types of devices, applications, and traffic in specific ways. For example, 5G networks can push through mission-critical devices so that they keep operating, being prioritized ahead of others, even if there’s a network disruption. The gradual shift to 5G in 2019 and beyond is expected to forever change the way we interact with technology. Lightning-fast speeds, incredibly low latency, and the capacity to carry massive numbers of connections simultaneously will engrain technology into our daily lives even more. More than that, the shift to 5G is also an absolute necessity if we want to continue to rely on mobile connectivity. Carriers are essentially running out of LTE capacity in many metro areas, and 5G opens up new routes and capacity to carry that data, adding vast amounts of spectrum in bands that have not been used for commercial broadband traffic previously. As we get closer to full-scale 5G development and adoption the buzz around its potential to drive business transformation will continue to expand. 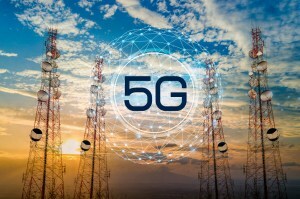 If you want help demystifying the 5G hype from reality, and you’d like to learn more about what 5G services are available today, and what’s coming, talk to Broad Sky Networks! We can help you map out a smart and sustainable 5G wireless plan and position you to take advantage of new profitable opportunities available. Don’t wait!